View of the Caribbean island of Curaco. The island was discovered by Spanish navigator Alsono de Ojeda in 1499 and was settled by the Spanish in 1527. 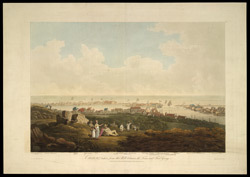 Since 1634 it has been under Dutch control and Curacao's strategic position and natural harbour meant that the Dutch West India Company quickly developed the island into an important commercial centre.